Before playing Marquise Lafayette in the Broadway musical Hamilton (which other people have continuously attempted to convince me is both good and groundbreaking) or being 1/3 of clipping, Daveed Diggs was a solo act. Deathbomb Arc Records has reissued his 2012 release on tape for the first time. This is not what fans of Diggs other work might expect. “Small Things to a Giant” has a much more standard Bay Area vibe to it. Although I guess considering the Bay sound is usually in front of most other rap calling it standard is a bit of an oxymoron. There isn’t any noisy distortion or loud screeching electronic effects. Even though he does prophetically mention preparing to win a Tony on “Fresh from the Hood”, he’s not playing a character. Fans of Diggs more acclaimed work should look to this as a document in his evolution. Hamilton fans will probably still enjoy it because it’s full of various historical references. 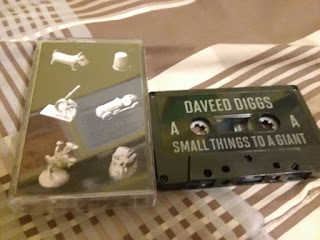 Clipping fans who know him for his highly technical, fast delivery might be interested in seeing how Diggs was able to spit over slower beats. West Coast hip hop fans familiar with the Bay Area sound won’t need any further context to appreciate the somewhat denser than usual bars on varying topics over the familiar beats that define it. Deathbomb appears to be all sold out but you can stream it below. I’m as surprised as you are that I woke up this morning still breathing oxygen on planet earth, huffing down sweet gulps of fresh air while perceiving the surroundings of my bedroom. It was touch and go there for a while – I just never know when the universe is going to wink out of existence, so I try to engender a healthy sense of awe within myself at the most mundane things. Here’s the greatest news of all, at least on a day like today, when the act of waking up is itself particularly flabbergasting: you don’t have to settle for uninteresting music! I sure am not, and instead of reaching for the go-to morning rock records (whatever your choice is, be it Sublime, Korn, Dave Matthews, or another musical artifact), I grabbed the top tape off the #CASSETTEGODS stack that’s sitting by my desk, hoping against hope to be blown into another dimension (but sort of not hoping that the tape would cause the universe to wink out – I think I’ve covered that I’m pretty terrified of that happening). Guess what I grabbed? Guess, guess! Yes, it was Three Fourths Tiger’s Indoor Voice, but I’d already reviewed that (two times, it turns out), so I put it back. 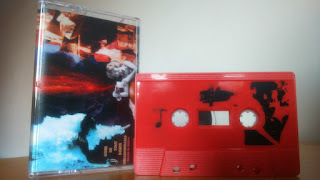 No, what I really grabbed was La Forêt Rouge’s tongue-twisteringly titled (in French, too!) Hors de tout doute déraisonnable (Trilogie du doute II), a sequel to part 1 of a planned trilogy. The title means “Beyond Any Reasonable Doubt,” and there is absolutely no way anybody’s going to have any questions about anything after listening to this supermassive black hole of a cassette engulf everything in existence. Over two songs and forty minutes, the four-piece from Montreal melds stuttering funk, krautrock, and psychedelic Brazilian influences into one bizarre and compelling whole. Imagine Can and Fela Kuti harnessing Sun Ra’s comet, and you’re close. Every second is improvised, and the players form their own magnetic field around one another, a field so powerful that it’s impossible to believe Montreal, the city, is still standing in the wake of this thing. It’s cosmic; it’s out there. It’s more powerful than we can possibly imagine. In fact, I’m willing to bet that the flickering of reality at the edge of my periphery is actually being caused by me listening to this. Uh oh. “Indie” is the genre this album is listed under, and accurately so. A more accurate genre name would be "Indie With A Brewing Proclivity Towards Success." I determined this after giving the tape two listens. In my first listen I wasn’t sure what to think. Could it be? Am I really listening to grade-A indie material? In my second listen I found out. Warehauz is as pure as it is raw. It's garnished by the super abstract lyrics it presents. 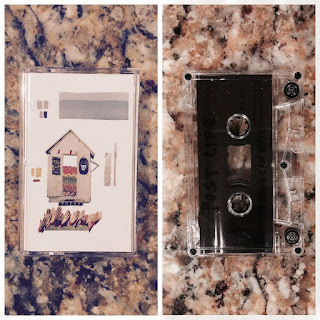 It was a good idea making this the first track on the album; it makes the listener aware that they've popped in a pretty great tape to listen to. 23 reminisces of happier songs from days of yore. And by "yore", I refer to the early 2000s. You won't be able to help singing along to the "high–HIGH-er, high–HIGH-er, now~"s wherever they appear. Embrace these catchy rhythms. Give in. The lack of lyrics in Serotonin paints a far prettier picture than the track would with any more words. Seretonin? More like... play for Conan... it's a stretch, but that's the way you're headed. Tabasco is as spicy a track as you imagine. The shift to a male vocalist was not a bad decision at all; I laud it. He's a tasty, tasty speaker. This band burns with potential. Prey is the little ditty you heard as a child, the one they played briefly as television transitions on some channels. It's nostalgic. It's anti-prophetic. It's art. NextGen is my favorite track on the album, and here’s why: the "singing seamstress", Brianna, uses a voice different from the fairy-tale-esque high pitched whisper-scream tone she uses in the rest of the tracks; the result is a marvelous one, especially because the song itself was so damn catchy! Dissolve makes apparent the potential in the vocalist’s throat. Just take a moment to admire the highs and lows of her singing. It's more than decent. It's more than noticeable. And last, but not least, the song Post Life; it describes its namesake band perfectly. I just really really really like it. It reminds me of the Strokes. I picture them as the Strokes of an alternate universe, with a Brianna Casablancas for the lead singer. That’s the best way for me to describe the album in general, really. This is the second coming of one of the greatest indie bands ever to have existed. There are myriad gaps that the Strokes skipped over in their conquest of the indie rock genre, and Post Life seeks to fill them with their own music. So now let’s do the maths. Two points for reminding me of my favorite band, another for a sweet album cover, and take a point for every member. Actually, yeah, sure, have another point. I’ll take it from Holy Hills. Your album scored an 8/10 on my scale. That's remarkable. You're remarkable. P.S. High expectations. Don't disappoint. 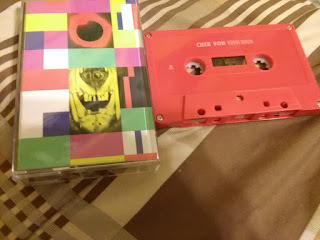 Cher Von is the project of vocal seamstress Chervon Koeun. Much like indie darling Juilanna Barwick, Kouen uses her voice without the constraints of language in expressing herself musically. She instead opts to make up words and fuses them with other sounds to make a final product that doesn’t sound quite of this world. The strange beauty of the music resonates more after multiple listens. Close your eyes and soak it in. John Darnielle said it best once: “If you cop my style, I’ll hunt you down and murder you.” Actually, he really didn’t say that, I put those words in his mouth. But if he really felt that way, then George Geanuracos would have to watch his back. Based in Richmond, Virginia, Geanuracos records under the name Yankee Roses (anybody else want to read that as Yankee Candle, continuously? ), and he sounds an awful lot like early Mountain Goats. Now, I like early Mountain Goats, so this isn’t necessarily a bad thing, but there’s no other comparison I’m able or willing to make. (OK, I’ll say Woody Guthrie, too. But that’s it!) Therefore, in the alternate universe where John Darnielle is a bloodthirsty maniac, he’s already on a bus to Richmond, because I gave Geanuracos’s location away. Whoops! That one’s on me. Like Darnielle, Geanuracos sings about the little details of life, taking on the mantle of storyteller and spinning modern yarns from the perspective of Appalachia. He is impervious to criticism, as he makes quite clear on “The Best Revenge” where he says, “The best revenge is living well.” Any haters are invited to observe that ol’ George is doing just fine and dandy. Apparently he has at least a few enemies, because on another song about revenge, “Mental Revenge,” he says, “I will have sweet, sweet mental revenge.” I’ve now said “revenge” quite a few times in this paragraph, so I’ll stop there. Let’s hope he’s feeling extra good up there on his judgmental pedestal, looking down on everybody else. Just kidding, you guys! Lighten up, geez. Unlike Darnielle, Yankee Roses covers a Guided By Voices tune, and it’s a beaut: “Motor Away.” That just makes me want to listen to GBV, though, so congratulations, Mr. Geanuracos, I know what I’m listening to next. Thanks for that inspiration. May you and your Washburn (if that’s what you’re playing) traverse the East Coast with impunity. I also hope that you stay safe – we don’t want any Mountain Goats–related incidents to occur. I say “Ah God!” and you say “Goddammit!” and we’re in a tomato/tomahto situation, sort of, where no one wins. It’s because of this that we have to sit back and you have to smoke a bowl (because I don’t hit that) and we have to reimagine our lives in overlapping Venn diagrams of languages of frustration. Because why? Because we need to understand each other, that’s why! Why are we even frustrated in the first place? And how can we overcome such a dire state of mind? Imagine the Flaming Lips, circa In a Priest-Driven Ambulance, writing tunes with Syd Barrett’s ghost and Courtney Taylor-Taylor instead of Miley Cyrus and you’ve got the gist. And that’s why you and I, in our different states of mental awareness and inebriation, should be putting our arms around each other’s shoulders and singing “Kumbaya” instead of flinging invectives at each other. 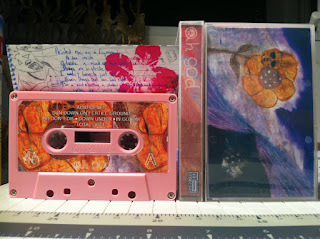 This self-titled cassette, pink shell, poly clear case, edition of 100, has the capacity to wrangle peace from the cosmos and plaster smiles on even the grumpiest Grinch’s face. Do yourself a favor and tap into that vibe, won’t you? You’ll thank me later, potato.